When we reduce the picture to an underlying A IS B format, we could say that in this image the underlying concept is STEVE JOBS IS JESUS. The original idea of this metaphor is the big success of Steve Job’s corporation Apple Inc. Apple users are extremely loyal to the brand, and even sometimes seem to think of Apple as a religion (underling metaphor APPLE IS RELIGION and APPLE USERS ARE DISCIPLES). To the Apple fan, the brand is sacred and divine. When we talk about Apple being a religion, and its users being disciples, the next logical step in this case is to compare one leader to another and that’s when we get to the STEVE JOBS IS JESUS metaphor. When we compare the creator of Apple to “the creator of all things”, there are a few similarities to discover between the two. Both of them were leaders in a way, both of them have died but still live on as icons today. Is it a monomodal or a multimodal metaphor? (see Forceville 2006; cf. also Forceville 2007, Bounegru & Forceville 2011). When just looking at the visual element in this picture, the message of Steve Jobs who’s being portrayed as Jesus definitely comes across. Therefore, we could say that the metaphor is monomodal. But it’s important to take into consideration the value of the logo. The Apple-logo is immediately recognizable and is being played with as well (the Apple logo as an aureole). Because of the different status that logos have and the language-like properties that they contain, the logo actually tells us a lot more than a visual picture alone does. Secondly, there’s of course the textual element. In this picture, the text establishes the fact that Apple is a religion. 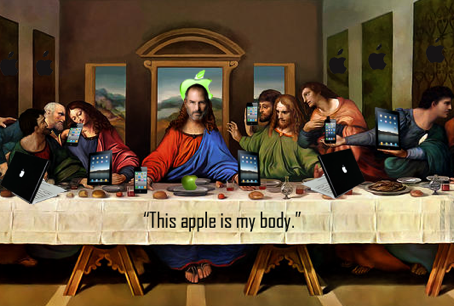 By saying “This apple is my body”, Steve Jobs is leaving us his body just like Jesus did (BREAD IS BODY OF JESUS). In this case, the picture suggests that Steve Jobs leaves us his apple, his corporation, after he dies. This textual element has of course a comical aspect and is a play on Jesus’ famous quote “This bread is my body”. Although its function doesn’t seem significant in a way, it does emphasize the intended idea of the metaphor, i.e. the underling metaphors APPLE IS RELIGION and APPLE USERS ARE DISCIPLES. When taking into account the visual element, the textual element and the significance of the logo in this picture, we can conclude that this metaphor is actually multimodal. Reflect on the consequences of the mode chosen for both the target and the source, as well as on the materiality/medium chosen to convey them. That is, speculate on what difference, if any, it would have made if target and source had been conveyed in a different mode and in a different medium. The image I’ve chosen to create is static. In moving images, a maker has more time and space to really express a certain idea and make it come across the way he/she wants it to come across. Therefore, a maker will probably be able to focus more on a specific element or on a combination of elements when using moving images. When a maker uses more different images, he/she will be able to really tell a story, which is more difficult when using just one static picture. Secondly, it’s important to take genre into account. If we had to put a label to this image, it would probably be a cartoon, because of its non-realistic and humorous aspects. There’s not a specific product that’s being announced here, so therefore this picture isn’t an example of advertisement. It’s questionable if this same metaphor would easily be used in advertising. In advertising the product is what’s important and usually not its maker. Besides, cartoons usually have a more sarcastic undertone. Advertisements also often have a comical aspect, but they try to really recommend a certain product too and therefore have a tone that’s in general more positive. Show your metaphor to a few friends and record their responses. Do they match your intended interpretation? “Ik zie hierin dat Steve Jobs een even hechte schare van volgers heeft als Jezus, die onvoorwaardelijk geloven in wat hij (= Apple) maakt en hem onvoorwaardelijk trouw zijn”. When looking at the responses, we could say that the underlying metaphor STEVE JOBS IS JESUS seems to be clear. The responses definitely match the intended idea. The metaphor that’s maybe a little deeper rooted in the image, the APPLE IS RELIGION metaphor, is also noted by the subjects and therefore seems to come across well.